Contraband is any item that should not be in the possession of your prisoners. If a Guard does find contraband on a prisoner, then a sound will play notifying you of the discovery, followed by a color coded pop-up notification, and finally an item will appear in your to-do list stating how many prisoners are in Lockdown or Solitary as punishment. Punishments can be altered if you research the Policy through Security from Bureaucracy. Contraband can be obtained through various ways, e.g. by smuggling it into the prison or stealing it from its facilities, and it can be used for various purposes, e.g. digging Escape Tunnels, getting high or killing guards and other prisoners. There are four types of contraband that can be found: Weapons, Tools, Narcotics, and Luxuries. Each explained in their sections below. For more information on Attack Power, see Toughness. Weapons are the most dangerous forms of contraband your prison can hold. Weapons are mainly used when prisoners fear for their lives and defend themselves against other prisoners. However, weapons can also be used against staff members for rioting prisoners trying to escape. Most weapons are made out of metal and therefore easy to detect by a metal detector. Keep in mind that prisoners can still put up a fight with their fists if they have nothing else to defend themselves with. Fists are categorized as weapons and have an attack power of 0.75 HP, and a recharge time of 1.5 mins. They are the weakest weapon in the game, so try to keep prisoners happy and the demand for stronger weapons won't be so high. Guard Dogs also have the ability to bite any prisoner who started a fight or attempted to escape. Dog bites have an attack power of 0.75 HP, and a recharge time of 1 min. Note: Recharge times are based on in-game time, not real time. Can be taken from Dead or Unconscious Guards and Riot Guards. Can be stolen from the Security Room and the Armoury. Can be smuggled into the prison. Batons can be used to bludgeon staff members or other inmates. Can be crafted in the Workshop. Shanks can be used to stab staff members or other inmates. Can be stolen from the Kitchen and the Morgue. Knives can be used to stab staff members or other inmates. Can be stolen from the Kitchen. Forks can be used to stab staff members or other inmates. Can be stolen from the Armoury. Guns can be used to shoot staff members or other inmates. Can be stolen from the Infirmary, the Morgue and the Library. Scissors can be used to stab staff members or other inmates. Shears can be used to stab staff members or other inmates. Can be taken from Dead or Unconscious Armed Guards. Shotguns can be used to shoot staff members or other inmates. Can be taken from Dead or Unconscious Snipers. Rifles can be used to shoot staff members or other inmates. Can be taken from Dead or Unconscious Guards and Armed Guards. Tazers can be used to stun staff members or other inmates. Can be taken from Dead or Unconscious Soldiers. Assault Rifles can be used to shoot staff members or other inmates. Can be crafted in the Cleaning Cupboard. Clubs can be used to bludgeon staff members or other inmates. Tools are the most troublesome forms of contraband your prison can hold. Tools can be used by your prisoners to dig Escape Tunnels or to climb over walls whenever the Danger level of the prison is too high. Again, non-violent prisoners who fear for their lives will almost always try to dig an escape tunnel to freedom. Jail Keys can also be used by prisoners during a riot as a quick escape attempt. This can be prevented by manually locking entrance doors to foot traffic. Most tools are made out of metal and therefore easy to detect by a metal detector. Keep in mind that some tools can be used as weapons, so try to keep prisoners happy and the demand for tools won't be so high. Spoons can be used by the prisoners to dig Escape Tunnels. Can be stolen from the Workshop, the Storage Room and the Forestry. Saws can be used by the prisoners to dig Escape Tunnels. Guards, Armed Guards, Riot Guards, and Dog Handlers. Can be stolen from the Security Room. Jail Keys can be used by the prisoners to unlock doors and attempt to escape. Can be stolen from the Workshop and the Storage Room. Screwdrivers can be used by the prisoners to dig Escape Tunnels. They can also be used to stab staff members or other inmates. Hammers can be used by the prisoners to dig Escape Tunnels. They can also be used to bludgeon staff members or other inmates. Drills can be used by the prisoners to dig Escape Tunnels. They can also be used to puncture staff members or other inmates. Wooden Pickaxes can be used by the prisoners to dig Escape Tunnels. Can be stolen from the Forestry. Axes can be used by the prisoners to dig Escape Tunnels. Can be stolen from the Laundry. Can be used to climb fences and walls by multiple prisoners. Narcotics are a menace that can be smuggled into your prison, and prisoners can steal narcotics from rooms that contain them. Narcotics have adverse effects on prisoners, making them more violent and can potentially cause them to overdose. Narcotics can develop into an Addiction that will cause prisoners to seek out drugs more often if left untreated. Most narcotics are categorized as smelly substances and therefore easy to detect by a guard dog. Employing the use of cell searching will also catch this type of contraband. Can be stolen from the Infirmary. Take care of drug need. Can be stolen from the Infirmary and the Cleaning Cupboard. Can be taken from the Visitation Room. Used for prisoners addicted to Heroin/Cocaine. Luxuries relief the need of the same name, and booze also the Alcohol need. Some luxuries are categorized as smelly substances and therefore easy to detect by a guard dog. Employing the use of cell searching will also catch this type of contraband. Can be stolen from an Office Room. Used for prisoners addicted to Alcohol. Can be stolen from the Security Room, from an Office Room, and from a Staff Room. Take care of luxuries need. Can be stolen from an Office Room, and from a Staff Room. Lighters can be used by prisoners to cause a fire emergency to occur in your prison. The following pieces of contraband exist in the game, but they don't have any category associated with them and have little to no properties that make them function. Additionally, there is no possible way a prisoner can obtain these items unless they knockout or kill staff members that carry these items. These are mostly neither metallic nor smelly substances, which means they cannot be detected by metal detectors or guard dogs. Employing the use of cell searching will catch these pieces of contraband. Prisoners are not stupid, and will find creative ways to smuggle, steal, and use contraband. New arrivals will almost always carry contraband from the outside of your prison when they are dropped off by a Prisoner Bus. Contraband will also be smuggled into the visitation room by friends and family of the prisoners, unless it is a secure visitation room using Visitation Booths instead of Visitor Tables. Also deliveries brought by a Supply Truck (e.g. food ingredients, metal sheets for the workshop, prisoner uniforms, Shop Goods, construction materials) may contain smuggled contraband, which the prisoners then will try to collect. However, not all pieces of contraband in the game can be smuggled into your jail. Prisoners will also get their hands on contraband whenever they enter unsecured rooms containing items that can be stolen. An example would be the workshop which holds screwdrivers, saws, drills, and hammers, and also is the place where prisoners can craft shanks and wooden pickaxes. To detect such sources of contraband, use the "Dangers" view in the Intelligence menu. Such rooms should be secured by metal detectors or guard dogs, though both won't be able to find all possible contraband. Please note that this view doesn't show potential target rooms for items containing smuggled contraband. The source of stolen contraband will always be the rooms, not any specific objects. So e.g. an Armoury will always contain contraband, even if you placed no objects in it, while putting a Weapon Rack in the yard is absolutely safe. Contraband will also be thrown over fences from the outside by friends and family of the prisoners (over a maximum distance of 10 squares) as arranged before via Phone or in the Visitation room. The prisoners will then try to be at a certain point near the outer boundary of the prison at a certain time. Prisoners can trade their stolen contraband with other prisoners for money. Prisoners will sell items they don't particularly want, and use that money at the Shop, to pay protection money to Gangs or to buy other items from other prisoners. This gives them a motivation to steal items in which they don't have any personal interest. The price of any item is based on the supply and demand of that item within the prison. The approximate trade prices of all items, along with their supply and demand, can be seen in the Intelligence / Dangers view. While prisoners will behave better when guards are nearby (e.g. the chance of a prisoner stealing something from a room will be reduced drastically by the number of guards in that room), neither guards nor any other staff prevent prisoners from stealing contraband or get alarmed when they catch prisoners doing so. Only guard dogs (and metal detectors) may sense prisoners carrying contraband. Anyway, prisoners will usually try not to carry contraband with them until they need it, but to hide it in their cells instead. Guards will have to search prisoners or their hiding places explicitly to find contraband. 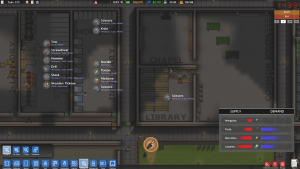 If your prison does have a reception room, all incoming prisoners will be systematically searched there and any contraband they carry with them will be found. The reception requires the availability of many guards, though, and significantly slows down the process of intake. Metal Detectors may be placed at any door, especially in front of rooms containing metallic contraband, e.g. workshops. Non-metallic contraband will not be found, however, and even for metallic contraband there is no 100% detection rate, while Metal Detectors are expensive and need a lot of power. Another strategy to use in order to control contraband is to hire some Dog Handlers with Guard Dogs to sniff out any smelly contraband your prisoners may be hiding. They may be used to patrol critical areas of your prison, e.g. the exits of rooms containing narcotics, but like Metal Detectors will only find metallic items, guard dogs won't find anything that doesn't smell. Occasionally, prisoners flash out their contraband item into view for a split second without actively using it. The split second may be enough for a player to notice and conduct a manual search of the prisoner. Guards will find any contraband if they actively search the prisoner carrying it or his contraband hiding places in his cell. They may also search the items possibly used to smuggle contraband (e.g. kitchen ingredients). This may be done manually by the player, automatically through Policy upon any misconduct of the prisoner, or for a whole prison at once using the Shakedown Emergency Action to clean up the whole prison. However, doing this will piss off your prisoners, so use it sparingly. The effectiveness of searches depends on the staff morale. If the guard performing a search is pissed of because his needs are not fulfilled, he is more likely to miss contraband during a search than otherwise. The Intelligence menu will help you to prevent prisoners from obtaining contraband. In the Dangers view you will get an overview which rooms of your prison are a source of contraband, so you can take according measures. In the -24 Hours and -7 Days you will see which contraband you found where recently and how it came in, so you spot your weaknesses. In the Informants view you may see the current positions of hidden contraband items within your prison, as well as arranged spots for throw-ins, depending on the coverage of your prison by Confidential Informants and Phone Taps. There's several contraband items that are not in the game, but are in the sprite bank. These items may have been removed for any reason or had been intended for future implementation: Shovel (Two handed), Fire extinguisher, Boom Mic, AK-47, Cup, Cleaning belt, Welding mask, Sledgehammer, Pneumatic drill, Pool cue. These items are shown only in the cutscenes: Battering ram, Uzi, Microphone, Megaphone. Choosing Saphara Acknova as a warden will give you a small cut of the re-sale value of each piece of contraband found. Prisoners found with contraband will be fined directly from their savings. This page was last edited on 25 March 2019, at 23:50.